Operating Agreements, Partnership Agreements, Bylaws: Whether you are opening a corporation or a limited liability Company, the Law Office of Frederic Waczewski, P.A. can help you prepare the foundational documents to ensure that your business will be structured appropriately. An operating agreement is a legal agreement utilized by LLC’s which outlines the ownership and operating procedures of that business. A partnership agreement is a written agreement between two or more parties who decide to work together in order to formulate a business that earns a profit. Bylaws: This document outlines the operating procedures of a corporation. Contracts: We handle everything from simple one-page agreements to complex contracts covering all areas of business. For example, franchise agreements, non-compete agreements, purchase agreements, and much more. Commercial Leases: We represent both tenants and landlords in commercial tenancy, and we are prepared to draft complex lease agreements or help review and negotiate favorable lease terms. Purchase Agreements: If you are buying or selling a business we can help facilitate the transaction. 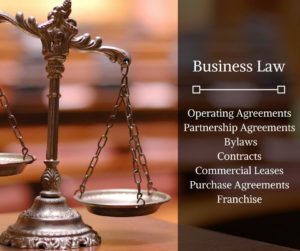 Franchise Agreements: If you are an investor looking to buy a franchise or a business owner that wants to develop a franchise, our law firm has the experience to help you in this area from beginning to end. We have the extensive knowledge and experience needed to create the franchise disclosure documents and all other documents that are related to the franchise. Time and time again, this law office has received glowing reviews from clients who realized the value that having a professional on their side gave them. Ensuring that your business is legally sound, your assets protected and that all aspects of agreements you enter are fully understood and clear is important to your success. As a well-respected business attorney Orlando clients know that Frederic E. Waczewski will answer their calls, review every detail of their agreements and give them the attention they deserve. To schedule your free consultation with the business Attorney Orlando company owners trust, visit our contact page. Law Office of Frederic E. Waczewski, P.A. is a recognized law firm with a roster of clients that range from small mom and pop shops to huge multi-million dollar corporations. Our boutique law firm is passionate about providing clients with an exceptional service. Call us today (407) 999-4957.